To analyze the complex morphogenetic events and the underlying mechanisms, the presentation of sequential morphological changes occurring in the embryo (4D visualization) is essential. In this project, we imaged nearly 1,300 staged human embryos by the magnetic resonance (MR) microscope and episcopic fluorescence image capture (EFIC). Further, 3D images of embryos and their organs at each developmental stage were reconstructed based on the MR and EFIC data, with the aid of computer graphics techniques. 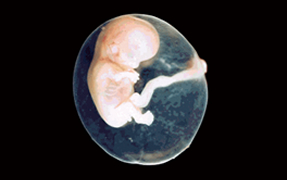 In this project, we imaged nearly 1,300 staged human embryos by the magnetic resonance (MR) microscope and episcopic fluorescence image capture (EFIC). This site is maintained by the Congenital Anomaly Research Center, Kyoto University Graduate School of Medicine. Copyright © Congenital Anomaly Research Center, Kyoto University Graduate School of Medicine. All Rights Reserved.